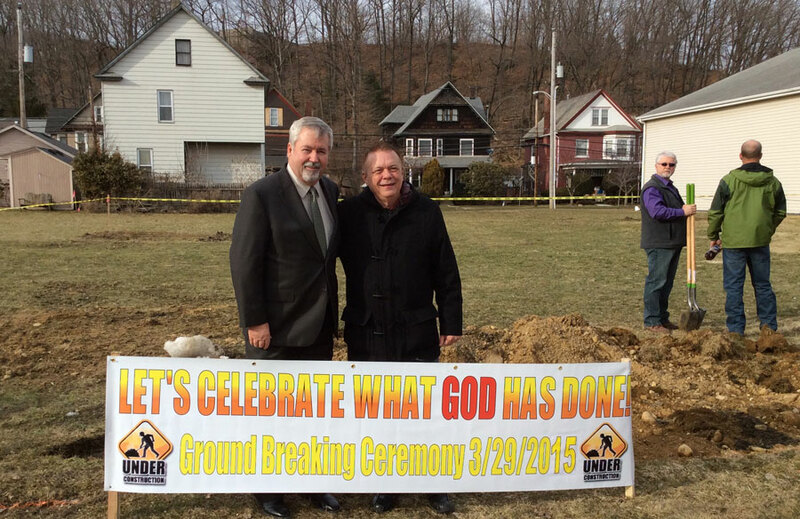 Bishop Phil Whipple (left) with Pastor Gary Small. 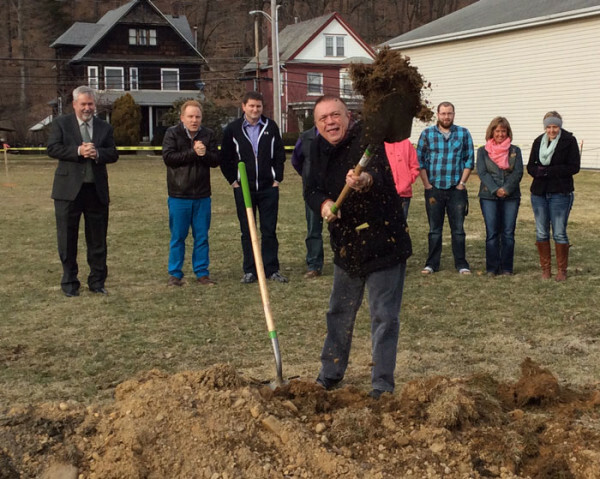 Gary Small, pastor of Atlantic Avenue, throwing a shovel of dirt. Bishop Phil Whipple turning a shovel of dirt. Rev. Gary Small has been pastor of Atlantic Avenue since 1991. During that time, attendance has grown from the 100s to nearly 600. 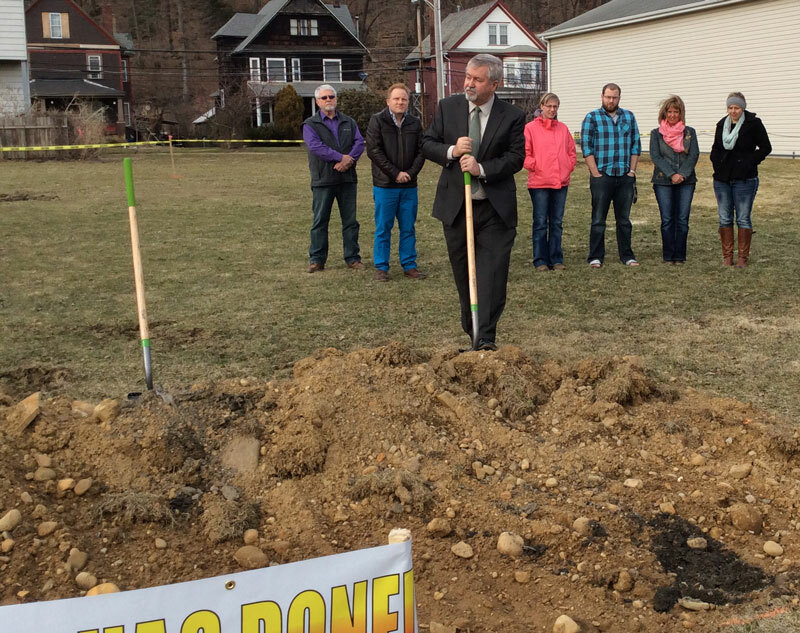 Bishop Phil Whipple was on hand for the groundbreaking. 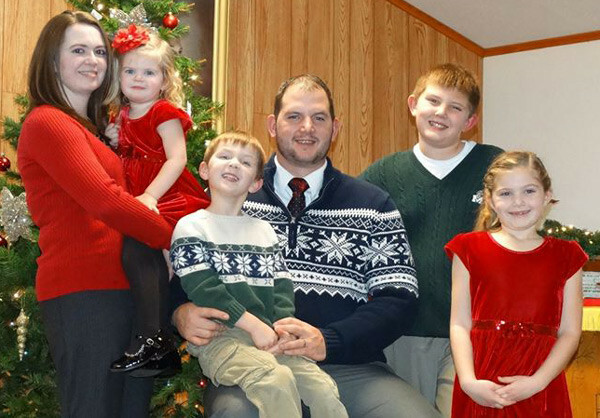 19 Mar Ricky Hull Assigned to UB church in Charlotte, Mich.
Ricky and Jami Hull and children. Ricky Hull concluded his ministry at Mt. Hermon UB church (Pomeroy, Ohio) on Sunday, March 15. He has been senior pastor there since 2012. Ricky has been named senior pastor of Crossroads UB church in Charlotte, Mich. 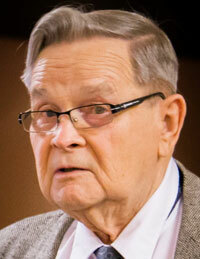 He replaces Mike Arnold, who retired as senior pastor last fall. In 2014, Ricky graduated from Winebrenner Theological Seminary with a Master of Divinity. He and his wife, Jami, a medical transcriptionist, have four children. Delegations from Lenaweee Christian School and Huntington University. 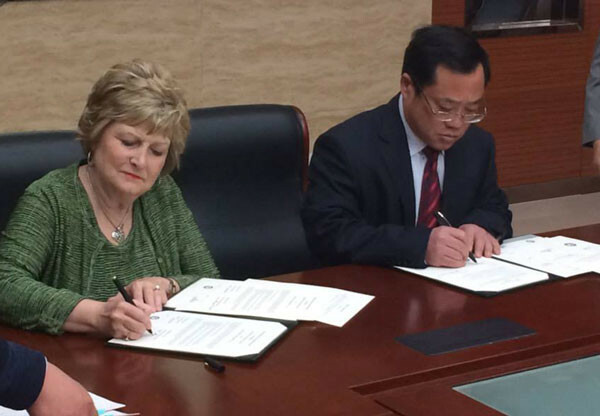 President Emberton and President Ma Chunlin of Liaocheng University signing cooperative agreements. 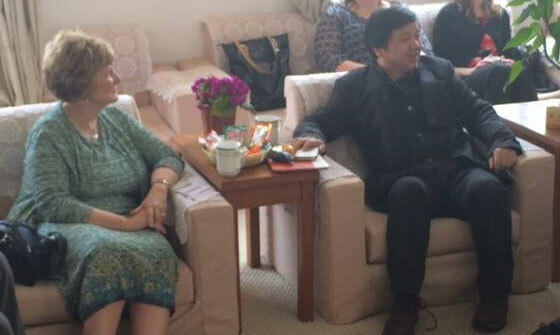 President Emberton meeting with Principal Sun at Tong Sheng Hu Experimental School in Hunan Province. 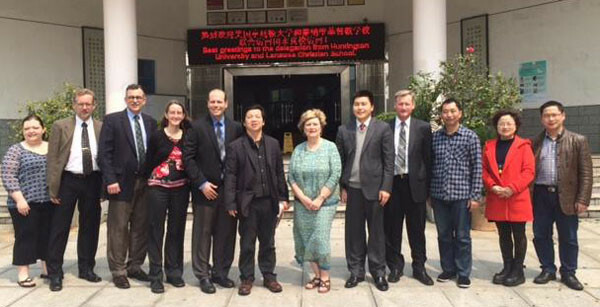 Administrators from Huntington University and from Lenawee Christian School in Adrian, Mich., are currently in China. They are spending ten days exploring partnerships with Chinese institutions. Dr. Mike Wanous, vice president for academic affairs. Dr. Luke Fetters, director of HU’s Institute for TESOL (Teaching English to Speakers of Other Languages) Institute. 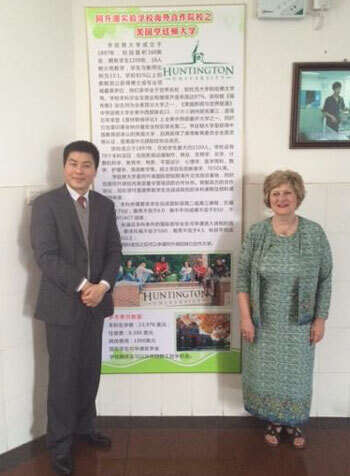 President Emberton with Alex Zhang at Tongshenghu Experimental School. Lenawee Christian School representatives are Trevor Cook, president, and Joy Carl, director of international studies. Visit Liaocheng University in Liaocheng, Shandong Province, to discuss opportunities for agriculture, business and English programs, as well as student and faculty exchange programs. Meet with officials from Tong Sheng Hu Experimental School in Changsha, Hunan Province, about a potential partnership. Visit China Hong Kong English School in Zhongshan, Guangdong Province, to dialogue about a Foundation Year program that would allow Chinese students to experience HU in China before attending the university in the U.S. Also, discuss summer programs. Visit Jilin University – Zhuhai College in Zhuhai, Guangdong Province, to discuss growing the summer TEFL (Teaching English as a Foreign Language) program and finalizing a joint degree program agreement. Also, discuss a faculty exchange program. This is the third trip to China that Huntington University administrators have made within a year to pursue partnerships. Huntington University has a seven-year history with China, having hosted summer English camps there since 2007. Those camps have expanded significantly with last summer’s programs involving 180 Chinese students, 80 Chinese teachers, 32 U.S. team members, and six weeks of camps in three locations. In addition, last fall, five HU alumni established an office at China Hong Kong English School and are teaching English classes there. In fall 2014, 10 percent of the international students enrolled at HU were from China. Learn more about HU’s Institute for TESOL Studies. Bishop Phil Whipple (right) with Chris and Sara. 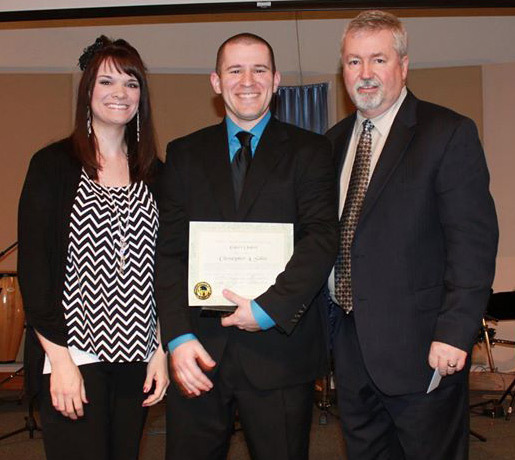 Chris Soltis was ordained on Sunday, March 15, at Shoreline UB church in Oak Harbor, Ohio. Chris is Pastor of Children & Youth Ministries at Shoreline. Chris holds a Master of Divinity from Winebrenner Theological Seminary in Findlay, Ohio. He and his wife, Sara Nichole, were married in 2006. Bishop Phil Whipple conducted the ordination at Shoreline. Last fall, Huntington University launched a major in agricultural studies. It promotes a Christian perspective on agriculture, recognizing a responsibility to be good stewards of God’s creation and to examine questions of sustainability and justice. The institute will admit its first students in the fall of 2015. Now the program has a name: the Haupert Institute for Agricultural Studies. The Institute was named in honor of Dale and Elaine Haupert, who have a long history with farming, Huntington University, and the United Brethren Church. The Hauperts attend Emmanuel Community Church in Fort Wayne, Ind. Huntington University’s plan to start an agriculture program resonated with the Hauperts, whose involvement in farming has spanned 52 years. Their family farm in South Whitley began as a 40-acre operation and grew to 2,800 acres. Dale also grew up on a farm. The Hauperts gave the lead gift that launched the Institute. Additionally, Dale serves as a charter member of the university’s Agriculture Task Force, and Elaine has hosted fundraising events for the institute in their home. Dale also has been a member of HU’s Board of Trustees for 26 years, so it’s a perfect blend of two long-time passions–farming, and Huntington University. Dale and Elaine decided to contribute their time and resources to Huntington University’s new program after having conversations with young people interested in pursuing careers in agriculture. The Hauperts were surprised when Dr. Emberton told them the institute would be named after them. For Dale, the opportunity to become involved with the institute came at a serendipitous time. Just hours before he was approached about supporting HU’s agriculture program, he had read Jeremiah 29:11 after wondering if, at age 81, he could still make an impact. The verse says, “‘For I know the plans for you,’ declares the Lord, ‘plans to prosper you and not to harm you, plans to give you hope and a future.’” Like his wife, Dale was stunned that their step of faith resulted in an acknowledgement. Launched in the fall of 2014, HU’s Haupert Institute for Agricultural Studies promotes a Christian perspective on agriculture, which recognizes a responsibility to be good stewards of God’s creation and to examine questions of sustainability and justice. The institute will admit its first students in the fall of 2015. To learn more, go to huntington.edu/agriculture. Rev. Keith Davis, 88, passed away Wednesday, March 11, 2015, at Mercy St. Charles Hospital in Oregon, Ohio. He was living in Pemberville, Ohio, southeast of Toledo. Rev. Davis was a United Brethren pastor for 52 years, serving churches in Mermil, Bucyrus, Smithville, Bowling Green, North Baltimore, Fostoria, and Elmore. He served 25 years at Bethel UB church in Elmore and remained a member there. He also taught middle and elementary school for 22 years. Viewing: 1-8pm Sunday, March 15, 2015. Viewing location: Crosser Funeral Home, Elmore-Genoa Chapel, 19550 W. SR 52, Elmore, Ohio 43416. Funeral: 11am Monday, March 16, 2015. Funeral location: Bethel UB church, 2920 SR 590, Elmore, Ohio. Pastor Tim Sherman will officiate. Pastor Davis was born in Wayne, Ohio on April 16, 1927. His father died while Keith was an infant. He grew up helping his mother and siblings on their farm, and selling the produce they raised. He also worked as a salesman for Firestone Tires and was a Fuller Brush representative. Keith received his pastoral schooling from Huntington University, and his B.A. in Education from Bowling Green State University. 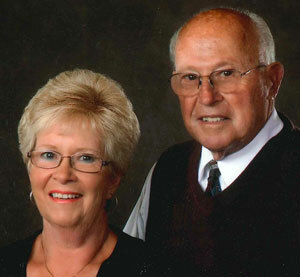 Pastor Davis and his wife, Edna, were married in 1952; after nearly 60 years of marriage, she passed away in 2011. He is survived by his four children. 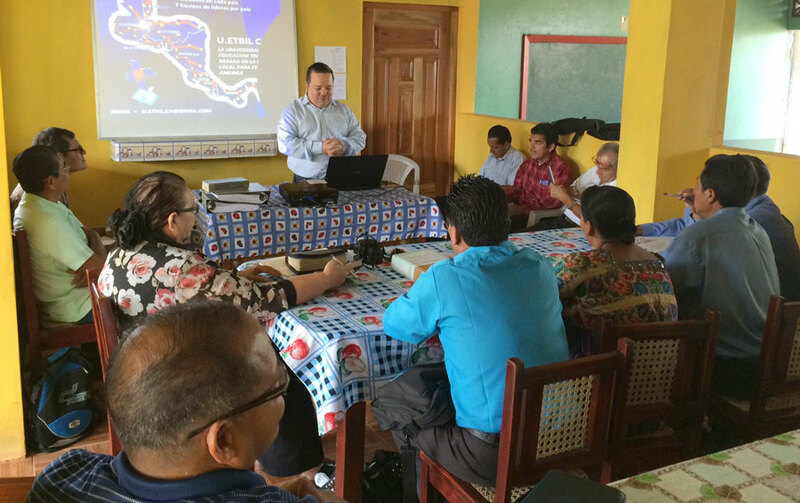 Twenty-five leaders from United Brethren churches are gathered together this week in Masaya, Nicaragua. They have come from Mexico, Guatemala, El Salvador, Nicaragua, and Costa Rica. 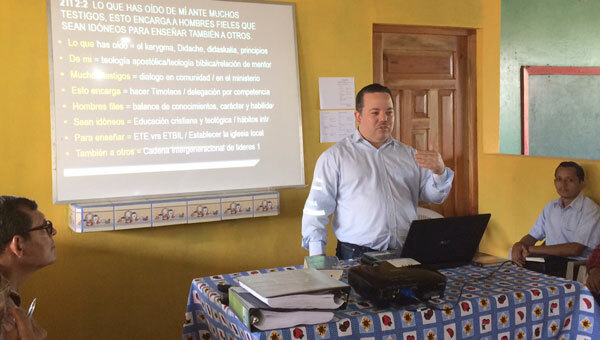 The focus of our time is to become acquainted with the ministry of ETBIL (Educación Teológica Basado en la Iglesia Local). For the past two years, Felix Zaldivar and Celso Midence, regional trainers for Central America, have been working to implement this ministry in Honduras. The ministry is focused on developing and multiplying disciples and leaders within the local church. This “in-service” approach is based on 2 Timothy 2:2: “And the things you have heard me say in the presence of many witnesses entrust to reliable people who will also be qualified to teach others.” This methodology used by Jesus and the early church contributed to the rapid expansion of the church. This is the first time we have gathered all of our Hispanic leaders for a retreat of this nature. Pray that God will help us embrace the challenge to make and multiply disciples and develop the leaders needed to expand the ministry of the church throughout the world—from “Latin America” to the ends of the earth. L-r: Rev. Randy and Chrystal Carpenter (left), Dwight Kuntz (right), and other workers. Working on the York Town roof. After ten-and-a-half years, the roof at York Town UB church in Jamaica is getting replaced. In 2004, a hurricane took the roof off the education building, and it has been exposed to the weather ever since. The destruction went far beyond the roof, as the inside of the building also sustained a lot of damage. After some minor repairs to the structure, a good cleaning, a new paint job, and a lot of new fixtures, the inside will once again be usable. The congregation at York Town has done a lot of hard work and fundraising to get back on their feet, but this has not been easy. 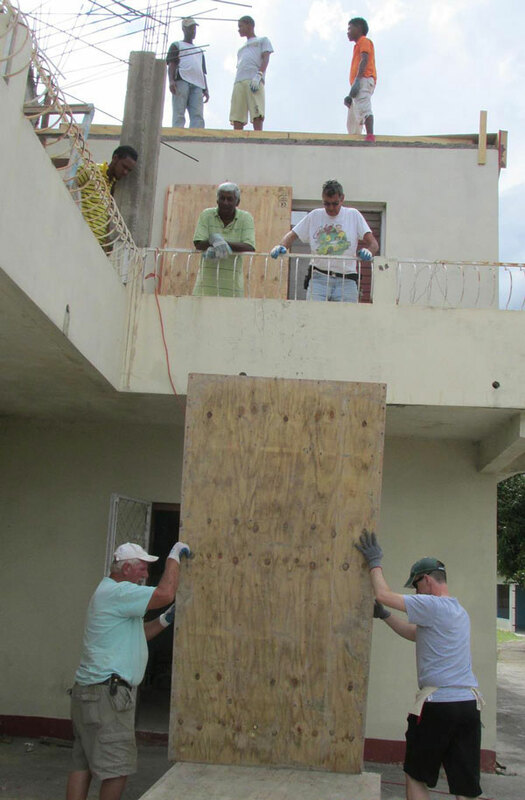 In came help from the Sunfield United Brethren Church from Sunfield, Mich. Together, they saw the forms for the roof of the building go up last week. The new cement roof was poured Monday, March 9, once again shielding the building from the weather and thieves. Help is still needed to restore the inside of the building, but it can now be done, and the building will slowly be put back into use. The congregation praises God for his faithfulness and the help of the Sunfield church. A big thank you to Rev. 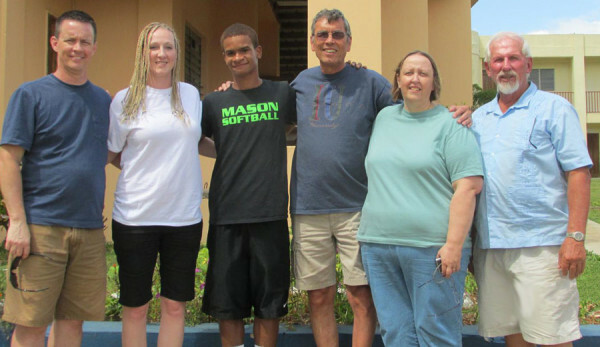 Randy and Chrystal Carpenter , along with Jim Steward from the Sunfield Church; Martha Hanley from the Eden UB church (Mason, Mich.); Troy Howell from the Salem UB church in Jamaica; and Rev. Dwight Kuntz for investing their time and labor to see this project through this first stage. 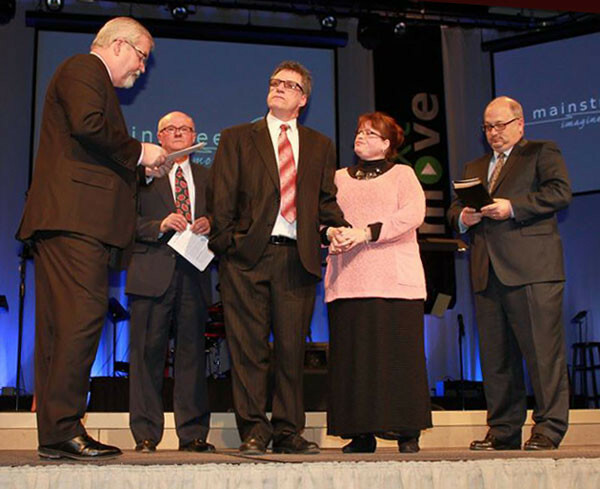 L-r: Bishop Phil Whipple, Terry Smith, John and Donna Authenreith, and Marty Pennington. Bishop Phil Whipple (left) with John and Donna Authenreith. 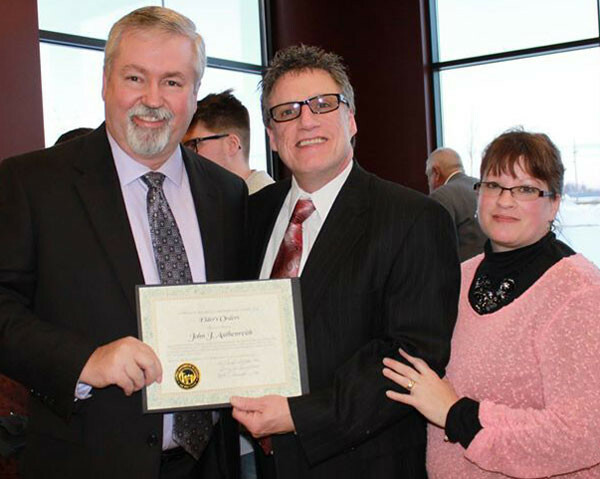 John Authenreith was ordained by Bishop Phil Whipple on February 18, 2015. John is Worship Arts Pastor at Mainstreet UB church in Walbridge, Ohio. The ordination service was held at Mainstreet, with senior pastor Marty Pennington and associate pastor Terry Smith assisting. John has served on staff at Mainstreet since 2006. He and the Mainstreet worship team led the worship singing at the 2007 and 2009 US National Conferences. Roger Reeck, UB endorsed missionary with Wycliffe Bible Translators, underwent ankle replacement surgery on February 17. On March 4, Roger sent this update. “I praise the Lord for you and for your prayers on my behalf. On Monday, I had my cast and stitches removed and am now in a boot and allowed a small amount of weight bearing. Everything has healed well, and xrays show that the alignment of the ankle replacement is right on! There is quite a bit of pain.